The D.C. Craft Bartenders Guild welcomed bartenders from all over the country to celebrate the demise of Prohibition. On December 5, 1933, the so-called Noble Experiment was finally overturned. Prohibition did not, as the Temperance movement predicted, get Americans to drink less or to see the “evils” of alcohol. From that day forward, bathtub gin, bottles procured from rum runners and dangerous, adulterated industrial alcohol flavored with sinister ingredients no longer needed to be the tipple du jour. This year, the D.C. 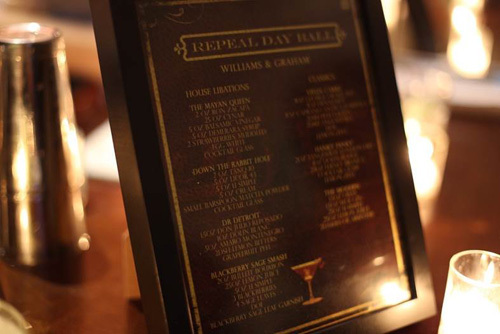 Craft Bartenders Guild hosted the 8th Annual Repeal Day Ball at the city’s Carnegie Library on December 4, the day before the 82nd anniversary of the Repeal of Prohibition. The event was attended by more than 800 cocktail fans, making it the largest event to date. In addition to the chance to further the current bar movement, guests were able to taste drinks at a pop-up of one of the country’s best bars. 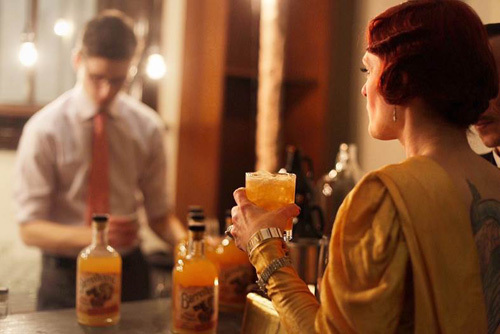 Sean Kenyon and his team shook things up by bringing their award-winning Denver speakeasy Williams & Graham to D.C.,, which took home the prize for Best American Cocktail Bar at this year’s Tales of the Cocktail. “While we’ve historically brought in bartenders from out of town, this is the first time we are recreating their bar,” notes MacBain. “We hope to continue the tradition next year.” Served up at this second level pop-up were drinks including a Blackberry Sage Smash and the classic Vieux Carré. The ball has been held at this venue for several years now, and its expansive space means that there is plenty of room for many bartenders from around the country to set up shop and mix up libations. This year’s event boasted around 40 separate bars spread out over 2 levels, including some tucked away in reading rooms that lent an exclusive vibe. Liquid highlights included the Wood Paneled Station Wagon from Ben Wiley and Owen Thomson of the upcoming D.C. tiki bar The Archipelago; the drink had Mt. Gay Black Barrel Rum, Coconut Molasses, pineapple, and aromatic bitters. Todd Thrasher of Eat Good Food Group created Relax Jamie! You Have Not Answered My Email About the 5th with The Botanist Gin, Cynar, burnt lime juice and kaffir bitters. Both drinks (and many others) could be found in the same room where the Blue Crescent Syncopators played Prohibition-era jazz. Lukas Smith and Trevor Frye of Jack Rose Dining Saloon / Dram and Grain dished out a Glenlivet Scotch-based punch called The Devil Went Down to Scotland that also had Malmsey Madeira, sweet flag and celery soda and peanut orgeat. Local “Mixtress” Gina Chersevani’s All Pink on the Inside was a bubbly beverage made with Macchu Pisco, grapefruit juice, cranberry-grapefruit spiced syrup and sparkling wine. To appeal to those who aren’t spirits or cocktail aficionados, 3 Star Brewing had suds on tap for thirsty beer fans. Perhaps this inclusiveness is the point of this ball and of Repeal Day in general. Whether your tastes lean towards whiskey, wine or IPA, on December 5 we celebrate being grateful to imbibe. Kelly Magyarics, DWS, is a wine, spirit and lifestyle writer, and wine educator, in the Washington, D.C. area. She can be reached through her website, www.kellymagyarics.com, or on Twitter and Instagram @kmagyarics. You'll have the opportunity to attend workshops and seminars presented by industry experts at the 2016 Nightclub & Bar Convention and Trade Show - register now! Repeal Day Ball Images by Corbin Goldstein.